Air NutRunner offer Battery Multipliers, Electric tools and Pneumatic Torque Nut Runner. Pneumatic Nutrunner: speed up maintenance & shutdown applications. RAD NutRunner are the FAST solution for torque situations needing up to 2" of thread run down. 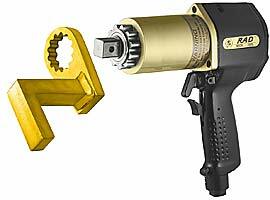 Smooth constant flow of controlled torque eliminating destructive hammering. Highest Power-to-Weight ratio of any air high Torque Wrench nutrunner. Torque-Range of 150 ft-lbs. to 8,500 ft-lbs. RAD Pneumatic NutRunner use a REGULATOR & LUBRICATOR between the Tool motor and the air supply, inside a tough plastic Cradle that holds the Tool, sockets, reaction arm & Torque-Chart . Aadjustable Air Regulator which Sets the PSI and Controls the final torque-output. A Lubricator with automatic drip oil feed to the air motor for air motor longevity. A Water Trap that helps remove water from the airline for air motor longevity. RAD NutRunners are the FAST solution for bolting applications needing up to 2" of thread run down. Smooth continuous flow of controlled power eliminating the destructive hammering of Rattle Guns. Highest Power-to-Weight ratio of any air powered Torque-Wrench tool. RAD Nutrunners are Lighter, Faster, Smaller and tougher than all the others. Extremely versatile pneumatic torque wrench, extreme duty use with pistol grip ease, faster than any Hydraulic Torque Wrench. Torque capacity of 150 ft-lbs. to 8,500 ft-lbs. Square Drives from 3/4" to 1-1/2"
A total high torque solution! 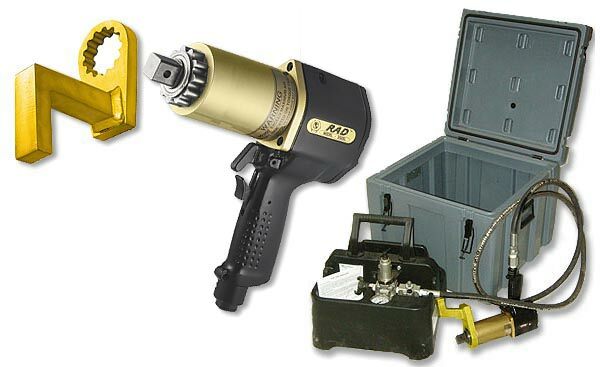 RAD Tools come complete with AIR REGULATOR & LUBRICATOR, hose, & torque-charts. 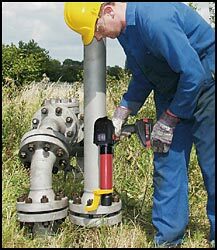 Pneumatic nutrunner deliver powerful, accurate & safe torque load. 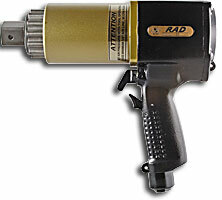 These lightweight and ergonomic hand held pistol grip tools are used in industries worldwide. 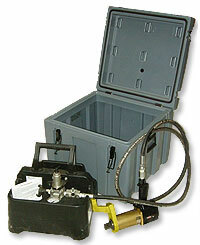 AIR REGULATOR & LUBRICATOR, hoses, & torque charts, in a weatherproof shipping case. The Pistol Grip reaction arm is sometimes misunderstood. The role of a reaction arm is to relieve the Tool Operator from trying to hold the tool firmly enough to apply the set torque. When a Pneumatic Nutrunner is exerting anything over about 50 Nm it becomes near impossible for the operator to hold a pistol grip tool. The forces the Wrench is putting into the nut is "equal and opposite" to the force needed to hold the tool stable. Thus the Reaction Arm takes up that "equal and opposite" force, holding the Nutrunner stable to turn the nut to the required torque. It's like pushing a car: you anchor you feet firmly, so they don't move, then push against the car so it DOES move. The Reaction Arm on a Pneumatic Nutrunner does exactly the same! It anchors the wrench stable, then pushes through the socket turning the nut so it moves - rotates. 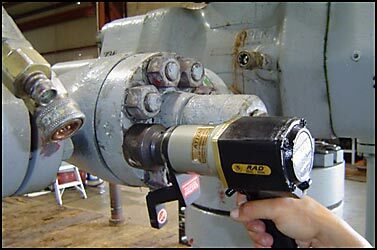 On most applications when using a RAD Pneumatic Nutrunner there is something for the standard Reaction Arm to connect with, thus anchoring the tool. The anchor point is commonly a nut next to the one you are tightening, or part of the equipment housing, or sometimes just the floor. But when there is no anchor nearby, you made need to customise a Blank Reaction Arm by welding up your own. Sometimes an Extension Arm is used when the closest point is not strong enough to hold the Tool stable. Remember the forces the Reaction Arm is taking, is "equal and opposite" to the force the Nutrunner is exerting on the bolt, so it must be solid enough to withstand exactly the same Force you are puting into the nut! Also See the range of versitile 2X speed NutRunner with automatic 2 speed gearbox. See also Battery NutRunner for the ultimate portable Torque-wrench. Out in the field this Battery Tool puts 1500 Nm into your hand.